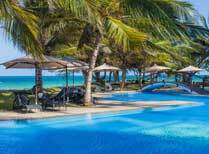 Why visit Kenya Coast & Lamu? 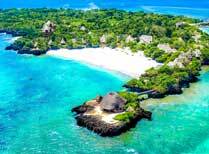 The Kenyan coast is a fabulous place to chill out on gorgeous, coconut-palmed fringed beaches, watch black and white Colobus monkeys emerging from the trees and dhows sailing on the horizon, or to swim in the Indian Ocean and enjoy Swahili food, hospitality and culture. 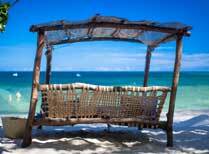 From mainland destinations such as Diani Beach to islands such as Lamu and Manda, you’re spoilt for choice! Relax! Lying on a white sand beach set against a lush green forest backdrop is a fabulous way to recharge your batteries before or after a safari. Snorkel or dive ”“ the waters along the coast and off Lamu Island teem with the vibrant marine creatures that live around the coral reef. Take a trip on a traditional wooden dhow and visit local fishing villages or neighbouring islands. Understand more about Kenya’s history and culture by exploring the winding alleys of historic Lamu Town on foot or by donkey, seeking out the fort and ancient mosques and houses. Shop for local woodcarvings or eat at an open-air restaurant. Visit the elegant small island of Shela, just a short boat ride from Lamu. Visit the 16th century Swahili ruins on Manda Island, where huge baobab trees dominate the skyline. Ferry yourself in a dugout canoe to explore the waters off Diani Beach, or take a dhow trip to Kisite Mpunguti Marine Park. 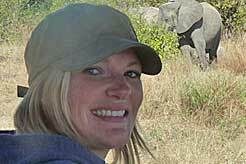 Head inland to visit Shimba Hills National Reserve and the neighbouring elephant sanctuary. Have a guided tour of Kaya Kinondo sacred forest. The best time to go to the Kenyan coast is during the cooler winter months, July to September, or late November through to March. May through to early July and November are the rainy months and if you want to avoid the heat then don’t visit in March and April. The coast and the islands are easily reached by air from Nairobi or Mombassa with flights taking between an hour and an hour and a half. This coastal area is the perfect place to end a holiday in Kenya giving a wonderful contrast to a safari in the Masai Mara or Amboseli reserves. 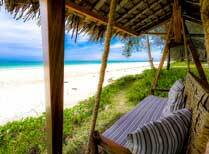 A beautiful boutique style lodge on the sands of Diani Beach in Kenya. A stunning location on miles of empty beach and plenty to see and do. A small, rustic beach lodge with excellent environmental ethics on Manda Island. A lovely small Swahili style house on the sandy beaches of Diani. 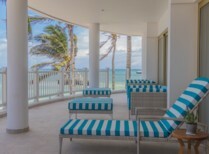 A luxury beach resort with rooms and apartments in Watamu, south of Malindi. A small, exclusive and charming hotel overlooking the entrance to the Shela Channel on the island of Lamu. Kinondo Kwetu is a small all-inclusive luxury beach lodge in the far south. 13 comfy chalets on the beach on Lamu Island, with great pool and strong links with local village. Kizingo Lodge has 8 bandas offers a comfortable and relaxing atmosphere on a 12km long beach. A luxury lodge right next to Shimba Hills. 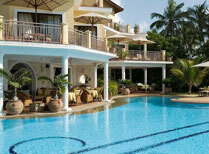 An all-suite resort on an unspoilt beach just south of Diani Beach, combining privacy with a wide range of facilities. Relax in style on the north west tip of Manda Island, Lamu. 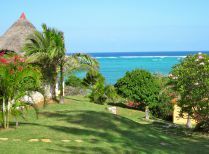 Msambweni Beach House is an exclusive boutique lodge on the southern Kenya coast. 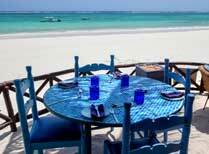 Pinewood Beach Resort & Spa is a friendly medium-sized, great value hotel on beautiful white sands south of Diani. 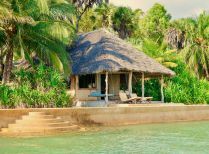 A gorgeous tiny island resort off the southern Kenyan coast. 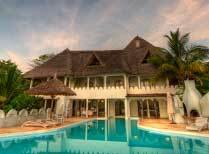 Small, luxurious boutique hotel on the Diani Beach area of coast. 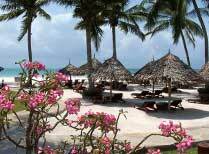 A large Swahili-style beach hotel with a pool and several restaurants. A small, luxury boutique hotel in the Lamu Archipelago. Tijara Beach is an exclusive hideaway on the Kenyan coast offering a tranquil and relaxing stay perched above the Indian Ocean. Turtle Bay Beach Club offers all-inclusive accommodation and provides entertainment for the whole family. 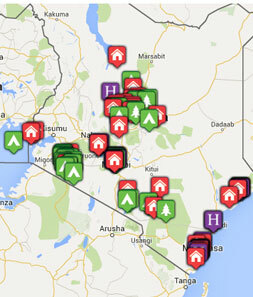 Flights from Europe to Nairobi take about 9 hours direct. Visas are required for European passport holders. Malaria is present in most of the country. No vaccinations are compulsory, except yellow fever if coming from an infected area.